We went walking out the California Western tracks today. There was no train to rob, but believe me, if it had gone by, this post would be a lot more exciting. Walking out the tracks is rather fun, actually. There are a large number of little bridges with all sorts of carvings, and tunnels and neat plants. Sometimes, rarely now, the train passes by. It used to carry lumber from the mill, but since the mill is closed now it carries tourists, who gawk at the trees and disembark in the middle of nowhere to buy cheap souvenirs and wait to reboard. 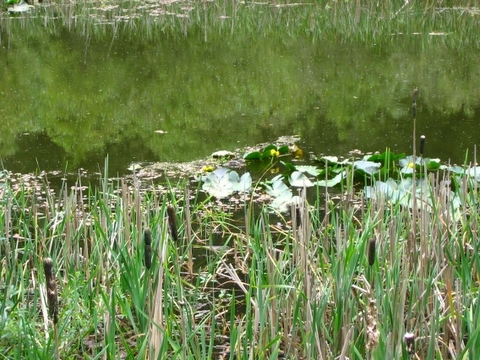 The tracks run along Pudding Creek, which in the photograph below looks stagnant and a little yucky–I really just wanted you to see the water lilies blooming. In the summer I hike out to Company Ranch, where there is a very nice swimming hole. We saw two banana slugs and a millipede. I took their pictures, but I figure you all know what banana slugs look like so I decided not to post them. There were also some birds, but they were extremely fast and far away, so none of the pictures came out. 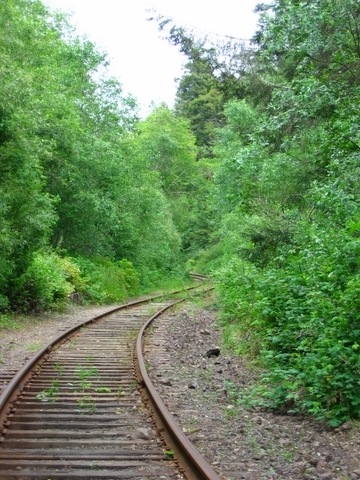 We also ran into a few people hiking along the tracks as well, which happens now and then. I suppose in a small town you get your jollies where you can. 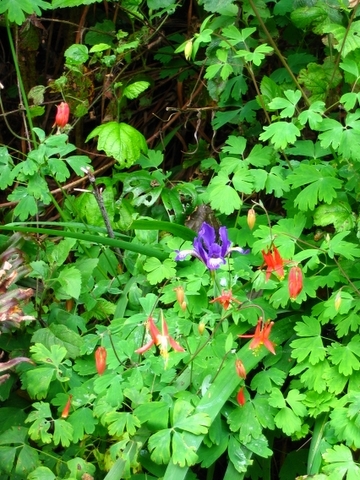 Here’s an iris and some red columbine, both rather pretty. There’s a lot of stuff in bloom right now, including a profusion of rich, purple, awesome iris. Further out on our hike, a tie had my name carved into it. Having an unusual name, it was a rather interesting occurrence. I certainly don’t remember carving it there, and there was no other message with it. We found a railroad spike, an o-ring, and some vertebrae, as well as a flattened penny. These items were duly admired, and we took two of them home.